No Fasteners. No Welds. No Rivets. We are living in a time where automobiles are constantly changing. Not just the design, but the way they are manufactured. The system in which automobiles are being produced is constantly changing. With technology evolving at a rapid rate, the way these automobiles are being manufactured and assembled is becoming more and more efficient every year. Whether it’s automation, or being assembled by hand, companies are looking for the next method to do it faster and cheaper. It has long been known that the use of fasteners, welds, and rivets are becoming obsolete for both interior and exterior applications in automotive and recreational vehicles. They simply do not provide the performance, aesthetics, or ease of installation compared to the competition. Foam Tape. There Is No Substitute. Foam tapes are by no means a new technology, in fact they have been around for decades. What is new, however, is the way foam tapes are being used. As foam tapes evolve, they find their way into new industries for different uses. Sealing gaskets for electronics, attaching glass panels to sky scrapers, bonding nameplates and logos to various substrates, and the list goes on. Foam tapes can change the performance, efficiency, and price for a variety of applications. More than just a “tape,” 3M attachment system products are backed by a full range of support services to assure that performance meets the specific product and design engineering requirements of a given application. By successfully satisfying individual automotive model program requirements since 1978, these tapes have changed the way that automotive companies and aftermarket trim and accessory part manufacturers attach exterior trim components. Because it requires no drilling into automotive painted surfaces, acrylic foam tape eliminates the concern for rust development associated with the use of mechanical fasteners. The unique stress relaxation properties of the tape’s foam core allow it to expand and contract with temperature changes. Stress forces of an application are dissipated throughout the foam core, providing excellent long-term performance. 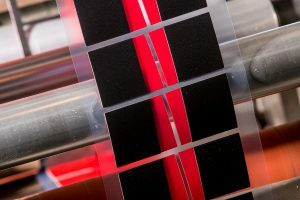 The viscoelastic properties incorporated into these tapes allow it to conform to surface irregularities and gaps, providing a better fit by compensating for some part-to-vehicle mismatch. The use of 3M acrylic foam tapes eliminates the unsightly appearance of bolt, screw or rivet heads associated with mechanical fasteners. Surfaces remain clean and smooth, contributing to styling and aerodynamic design. The use of acrylic foam tape can eliminate steps in the installation process, often requiring fewer parts and less labor time. 3M Tape Series PT1000 is a black, double-coated acrylic foam tape designed for the attachment of automotive exterior trim parts such as body side moldings and claddings. 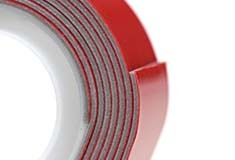 3M Acrylic Foam Tape GT7108 is a gray, acrylic foam tape designed for the attachment of emblems, nameplates, moldings, step pads and other automotive trim. It exhibits very good adhesion to traditional paints. Excellent adhesion to traditional auto paint and many advanced paint systems and helps support heavier parts such as spoilers and claddings. Provides stress relaxation when exposed to high loads and maintains tight bond-line aesthetics under normal conditions. Helps ensure good bond-line appearance. One-piece release and efficient tape application. SRP has provided custom gasket fabrication and die-cutting services since 1951. SRP is a Preferred Converter of 3M’s line of pressure sensitive adhesives and foam tapes in the converter markets. For more information about 3M’s line of acrylic foam tapes, you can visit our website, or call us at 847.593.5630.